Every animal shelter is being hit hard by the disease called Parvo. It is a devastating condition that effects puppies and young dogs and mostly certainly can kill your dog within 7 days after getting the disease. Please, please, please have your veterinarian vaccinate your puppy or young dog against this killer disease and save a life. The disease attacks the dog's digestive system. It is in yards, on the grass, on the sidewalk, puddles of water, everywhere these little puppies walk they can pick this up. Please read more about pet care at www.cvma.org/pets which is offered by the California Veterinary Medical Association. It's a very fun site for kids but it has wonderful information for the pet owner. The veterinarians listed alphabetically below treat large and small animals (L/S) where noted. The names provided are on an informational basis, we do not endorse one particular veterinarian. We list only DVM's who have no citations against them as verified through the California Veterinary Medical Board. Thank you to the four small animal veterinarians and the staff to extend the hours for the good of the animals. ~ Annual visit to your veterinarian is a minimum. This will allow maintaining your pets vaccination status as well as allowing your veterinarian to examine your pet to detect any health problems early before they become life threatening or expensive to treat. ~ Fleas. Using topical flea treatments can prevent skin problems as well as lessen the probability of your pet picking up intestinal parasites such as tapeworms. ~ Provide shelter. Your pet must be able to get out of the wind, rain, and direct sunlight year round. Preferably a dog house whether home made or store bought that doesn't leak and in which you can put loose bedding that your pet can form around him is important in the winter months. Burlap sacks filled with cedar chips will repel fleas and it conforms to the animals body..
~ Puppy Vaccinations. Vaccinating your puppy is very important in protecting your pet from contracting diseases such as distemper, parvo virus and other diseases that are transmissible between dogs. 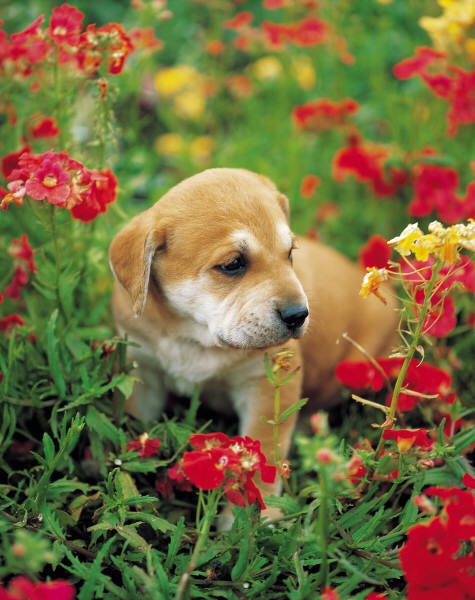 The time to begin vaccinating your puppy is between 6 - 8 weeks old. After the first vaccination two (2) additional boosters should be given at about 3 - 4 week intervals. Consult your veterinarian. ~ Talk to your veterinarian about a health plan to ensure your pet will be healthy for many years to come. Vaccinations, de-worming, heartworm test, a microchip implant and having your pet spayed or neutered are topics that should be discussed. Verify your veterinarian's license, the clinic or check on possible citations here. 98% of the animals impounded at the shelter have NO form of identification. A name tag, dog license or rabies tag on your dog will ensure that they can be returned to you. If your dog loses his collar, consider having a microchip implanted. The cost is minimal and the identification is permanent. It's up to you to keep your phone and address current with the company. Talk to your veterinarian about a microchip implant at your next visit. All animal shelters, rescue, humane groups and vet clinics can scan for a microchip. TAKING YOUR DOG OR CAT ALONG ON A TRIP? Consider buying the guide book the Automobile Association (AAA) has available: Traveling with your Pet: The AAA PetBook. The guidebook lists over 10,000 AAA-approved pet-friendly hotels in the U.S. and Canada. Plus dog parks, campgrounds and attractions that are pet friendly and has a directory of animal clinics. It's available at AAA offices. This product is available from SOS Survival Products. Order from their website: sosproducts.com. This is a reputable company who has been in business since 1989. Product description: Contains water, food dish, can opener, pet food lids, animal control lead, waste bags, emergency blanket, pet window sticker, LED headlight and first aid supplies. #11107 and is on sale for $36.00 now through January 21, 2012.